This ride starts in Portage Indiana at the intersection of Indiana HWY 249 and US Highway 12. Take Highway 12 west until you reach Michigan City. A winding two lane highway through the Indiana dunes National Lakeshore. Fall foliage is gorgeous, although anytime of year it is a beautiful ride. This highway is flat, with quite a few sweeping turns. It is blacktop, and very well maintained, with very few (if any) potholes. This highway is adjacent to the Indiana Dunes National Lakeshore so there is camping, public beaches on Lake Michigan, and picnic areas. There are also historic homes to view not far from the highway in Beverly Shores on the lakefront. There are fuel stops and a restaurant or two. There is also Michigan Citys light house at Franklin Park, a zoo and a pier. For your shopping needs there is the Lighthouse Mall which is a name brand outlet mall in Michigan City. on June 14, 2012 4 out of 4 members found this review useful. This is my favorite place to camp & swim in the summer note Dunewood campground is motorcycle friendly and right off hwy 12 you are close to the beach and Bartlett's Grill. Nice clean & Quiet campground with showers & restrooms and fifteen bucks a night. See you there ride safe! on June 29, 2009 4 out of 4 members found this review useful. My husband and I rode this route yesterday (6-28) and saw LOTS of other riders. It's a nice ride, nice twists, shaded portions from trees on both sides, but watch for the deer. You can take 12 up into Michigan and it's a nice ride all the way up. on April 30, 2010 2 out of 3 members found this review useful. on June 4, 2014 1 out of 1 members found this review useful. Rode with the wife yesterday down this route. Beautiful scenery. Open road. Perfect weather. There is a beach town called Beverly Shores you can cruise through which is right along rt 12 that is beautiful and full of huge beach front properties. Plenty of place to pullover while riding through the Dunes and admire the beach, forest, etc. You continue rt12 all the way up to the state of Michigan. New Buffalo, MI is a beautiful town. Take your helmet if you head to MI, state law requires wearing helmets. on November 4, 2013 1 out of 1 members found this review useful. on July 4, 2009 1 out of 3 members found this review useful. No offense to the submitter but this wouldnt be my choice of a good ride. 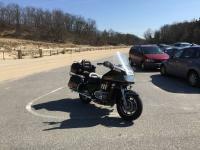 Personally I felt the ride going East on 1000N from US12 to US31 by South Bend was a better part of the ride. It's a county rode so be prepared to dodge a few rough spots. Thanks for the suggestion and if you live in that part of IN give it a ride. on July 11, 2017 0 out of 0 members found this review useful. Just wrote it last weekend. Very nice. Saw many motorcycles doing this route as well. I also suggest head to Michigan City and enjoy the small town atmosphere. However, no matter what you do, do not gamble at Four Winds Casino. I played blackjack there and I was beat royally. on April 10, 2017 0 out of 0 members found this review useful. I have ridden this route a bunch of times. Come on folks, this is NW Indiana. For our area, this is one of the nicest around. I come from Lowell so the added ride down SR2 from Lowell to Valporaiso is also pretty nice. When you head up 12 and you get into Michigan City, be sure to stop in at Shore Line Brewery for a nice cold craft beer and an appetizer. One beer is plenty, you are on two wheels after all. on August 7, 2016 0 out of 0 members found this review useful. This was a nice ride at the end of the day as we ended up in New Buffalo. Was an nice ride on a hot day when we felt the proximity of the lake and it's cooler air. on July 29, 2009 0 out of 0 members found this review useful.